Whether you are looking for a wedding, birthday, christening any type of celebration cake, we have cakes for every occasion. We make delicious handmade cakes beautifully crafted to suit your individual needs. 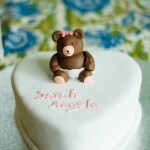 With a wealth of experience, Cute Little Cakes in Glasgow can supply cakes for all occasions. We have a special offer for the gentleman - a Valentine's day cake for their wife/girlfriend that we can combine with a special present for her. If you are looking for something a bit special or quirky, we are can custom design you a cake in an agreed time scale. 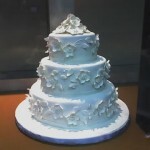 Some types of wedding cakes can take months of preparation, so call now to ensure that you get the cake that you want. 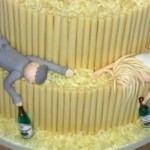 Although we can make any type of cake to suit your needs, wedding cakes is what we really do best. If you don’t have the time to wait for a traditional wedding cake, we can quickly create you a large wedding cupcake, or multiple smaller wedding cupcakes arranged in a gorgeous fashion that your guests will just loves. Our wedding cakes are made to top quality standards, with top quality ingredients to ensure that your wedding cake is every bit as special as your big day. 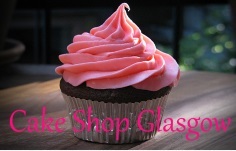 Our cake shop is based in Glasgow and we serve clients mainly in this area, but we will consider delivering anywhere in Scotland if it is a large enough order. If you have any questions, please contact us and we will aim to get back to you as soon as possible.